Nothing beats a restful evening. 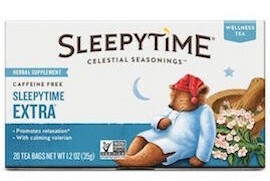 So if you're looking to unwind, try a cup of Sleepytime Extra. This relaxing and delicious herbal tea starts with the time-honored blend of chamomile, spearmint and the other soothing herbs found in our Sleepytime herbal tea. The result is Sleepytime Extra, a tea with a trusted calming benefit and great taste. Ingredients: Spearmint leaves, lemon grass, hawthorne berries, and orange blossoms. Safety Information: Warning: Recommended for adults only. If you are taking prescription medication, pregnant or nursing, consult your healthcare practitioner prior to using this product. Persons with allergies to the daisy family may be sensitive to chamomile. Do not drive or operate machinery after consuming this product.